“It’s a versatile route, where some of the days definitely suit Sagan. We have a strong team, so I see it as a great opportunity to have Alberto and Peter in the same race”. Italian WorldTour race Tirreno-Adriatico is set to host an array of big names. 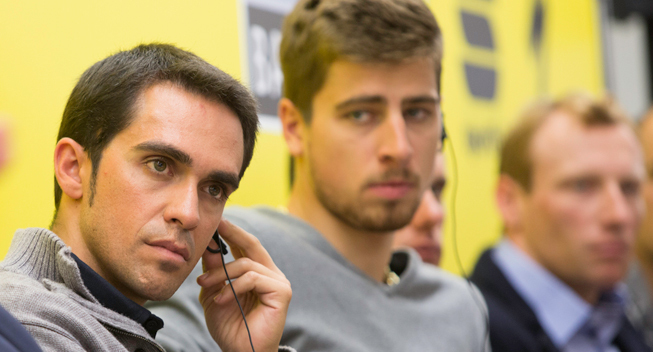 Tinkoff-Saxo is bringing a prominent squad headed by Alberto Contador and Peter Sagan, who will race together for the first time. According to Team Manager Bjarne Riis, Contador is reporting for GC-duty, as he looks to defend his title against strong rivals. Accompanying Alberto Contador and Peter Sagan into action is Ivan Basso, Roman Kreuziger, Daniele Bennati, Maciej Bodnar, Christopher Juul-Jensen and Matteo Tosatto. It’s a squad that comes with the clear ambition of making an impact on both stages and in the GC, tells Team Manager Bjarne Riis. “We’re sending a strong lineup to Tirreno-Adriatico just like we are in Paris-Nice, where Rafal Majka is leading the team. It’s obvious that we’re heading to Tirreno with ambitions, when you look at the squad. Alberto and Peter are of course very prominent but names like Kreuziger, Basso and the entire list of riders shows that we’re here to play a part”, says Bjarne Riis upon the announcement of the squad. Alberto Contador, who’ll be at the start of the race in Lido di Camaiore as defending champion, is also on-route to Giro d’Italia. However, Tirreno-Adriatico will not just be a quick stopover for the Spaniard. Tirreno-Adriatico will mark the first ever clash between the so-called “Fantastic Four” consisting of Alberto Contador, Chris Froome, Vincenzo Nibali and Nairo Quintana, who have never gone head to head in a prominent World Tour stage race before. Bjarne Riis reckons that this will have an effect on the race. “It will definitely mean that we’ll see the intensity of the race increase, not least from the media. It will be interesting for everyone to follow, but you can’t compare it to the Tour, where they’ll all meet again, as they are in different stages of their preparations”, says Bjarne Riis. Tirreno-Adriatico 2015 features a slightly less mountainous route than last year’s edition. And with a team time trial alongside the queen stage to Terminillo, the benefit from a strong team could prove decisive. “It’s a versatile parcours, where there’s terrain for different kinds of riders. It, of course, requires a strong rider to win, but also a strong team. We’re focused on the team time-trial, as this is an important discipline for us in general and it could also prove decisive for the GC, if the time gaps are small on Terminillo”, concludes Bjarne Riis. Alberto Contador will get valuable support from Ivan Basso, who was also at the captain’s side in Vuelta a Andalucia in late February. The Italian reports that his shape is on the ascendency and he looks forward to fighting for the win. “The Tirreno-Adriatico is similar to the quarter finals of the Champions League. It's as if you had to confront Real Madrid, Barcelona or Manchester United. We will have to go head to head against some of the best teams but we’ve put in a lot of hard work during the last few months and we are convinced it will pay its dividends. We are ready to fight and take Alberto to victory at Tirreno”. This year marks the 50th edition of Tirreno-Adriatico. The race starts with a TTT on Wednesday March 11 and is concluded in an individual time trial Tuesday March 17.